The boss of Ethiopian Airlines said he still "believes in Boeing" in spite of a crash involving the US firm's 737 Max plane which killed 157 people. Tewolde Gebremariam said: "Despite the tragedy, Boeing and Ethiopian Airlines will continue to be linked well into the future." Separately, Mr Tewolde also said the aircraft's anti-stall system was triggered prior to the disaster. The feature was found to be an issue in another crash of the Boeing's 737 Max. In a statement outlining the close ties between the Ethiopian and US airline industries, Mr Tewolde said: "Let me be clear: Ethiopian Airlines believes in Boeing. They have been a partner of ours for many years." He also said that more than two-thirds of its fleet is made up of planes manufactured by Boeing. Ethiopian Airlines also has an additional 25 Max 737 aircraft on order with Boeing, after taking delivery of five of the planes. Last week, Garuda Indonesia said that it would cancel its order for 49 Boeing 737 Max 8 jets after it said its customers had "lost trust" in the plane. Boeing has 5,012 orders for its 737 Max aircraft, 376 of which have been delivered so far. A team of experts, including people from Ethiopia's Ministry of Transport, is examining data from the black boxes recovered at the site of the crash on 10 March near Addis Ababa. It is the second fatal incident involving a Boeing 737 Max in less than five months after a Lion Air aircraft crashed in Indonesia last October, killing 189 people. All Boeing 737 Max planes are grounded. Meanwhile, Mr Tewolde told the Wall Street Journal that an anti-stall system on the plane, known as the Maneuvering Characteristics Augmentation System (MCAS), appeared to have been activated before it crashed. While he said that he did not have access to the flight data recorder and cockpit voice recorder recovered from flight 302, he said he had listened to communications between the cockpit and the control tower at Addis Ababa. Boeing is preparing a software fix for the system - which must be approved by the US Federal Aviation Administration - which is designed to stop the plane from pointing upwards at too high an angle, where it could lose its lift. On the Lion Air crash, it was discovered that the system pushed the nose of the plane down a number of times before impact. Mr Tewolde told the newspaper that Boeing should have "more transparent" about MCAS, which was a new feature on the Max aircraft which began flying commercially in 2017. He said: "And even after the Lion Air crash…more should have been done from the Boeing side in terms of disclosure, in terms of coming up with strong procedures, stronger than what they gave us." Boeing said it will hold "an information session" with pilots, operators and regulators on Wednesday to discuss software and training updates for the 737 Max. 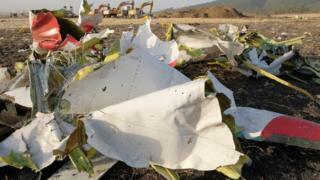 There is also speculation that a preliminary report based on data from the Ethiopian Airlines's black boxes could be released as soon as this week.